Téléchargez vite vos Vines ! Sujet: Téléchargez vite vos Vines ! Pour ceux qui n'ont pas la foi de lire le blog ou qui ne parlent pas Anglais, je récapitule : vous choisissez une page web qui contient tous les vines qui vous intéresse, vous l'enregistrez sur votre pc au format html seul, vous la donnez à manger au logiciel et BOUM vous avez tout qui s'affiche. J'ai pas réussi à faire autrement, mais je pense que c'est déjà pas mal, vous me dites ce que vous en pensez ? It has been announced, Vine will no longer be continued by Twitter. Fortunately enough, there are still a few months to go, so still a way to grab them all ! CoffeeGames Studio is proud to bring you an application allowing you to download them all at once : you no longer have to do it by hand ! 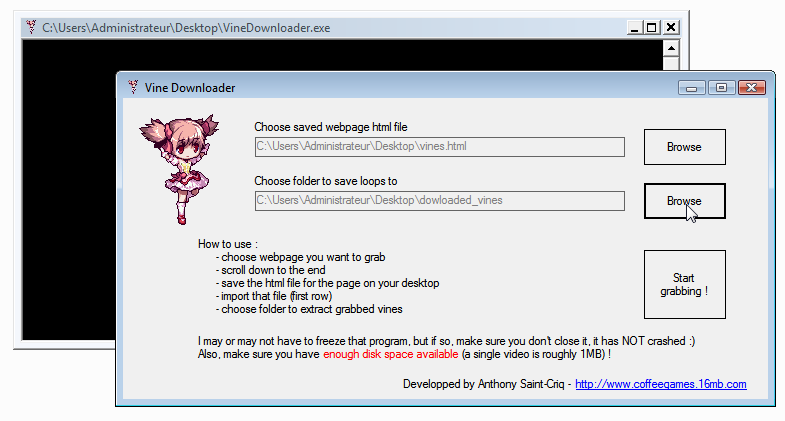 VineDownloader basically gets the source code of the page where are your favourite vines, in order to then get all the videos URLs. It simply loops through all the found entries of a vine, and grabs it for you. It roughly takes 2 to 3 seconds to get one, or it could be less, depending on your web connection. Be careful about one detail : some pages list up to one or two thousand of vines, and each vine is like 1MB, so it can increase fast ! Make sure you have enough disk space available ! After that (and this is the most annoying part...), you have to scroll down up to the end of the page (or up to wherever you want, but the remaining vines won't be dowloaded at all). This is in order for you to feed the program with the page that it cannot load itself. After that, a window will popup : save the html file for the page wherever you want (it doesn't matter). I'll put it on my desktop named "vines.html". Make sure you download the full html page, not only the rough HTML ! There are two "Browse" buttons. Click on the first one to import the previously created html. Then click the second one to choose the folder where you want me to extract the vines. Make sure everything is correct. You can click the third button, and move on to that weird black window. 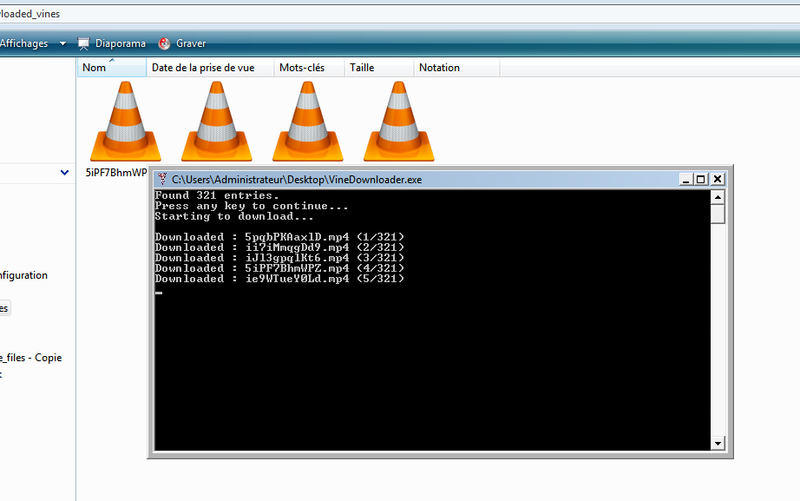 It will tell you how many vines it has fouund, so you can calculate the required space on your disk. When you're done, simply press a random key. It has now started working on its own ! Sujet: Re: Téléchargez vite vos Vines ! Trop cool, ça marche super bien, merci ! 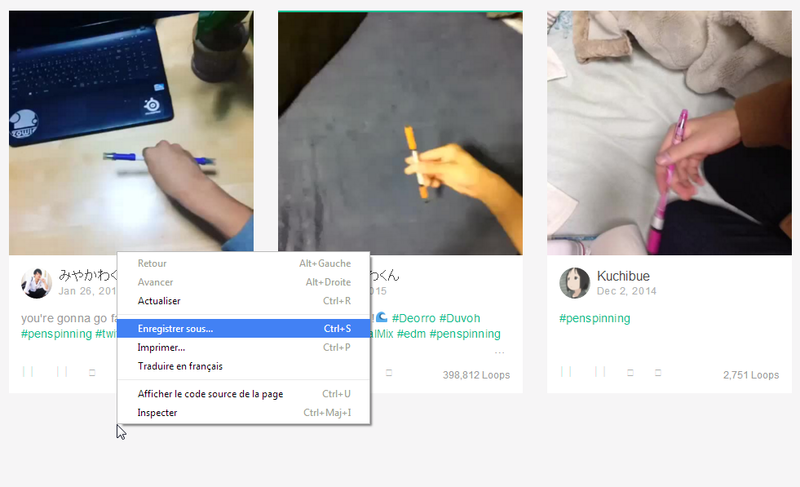 @VT : tu as bien scrollé jusqu'en bas de la page pour faire apparaitre toutes les vines avant de télécharger la page ? Ah tiens étrange... Tu es sur quel navigateur @VT ? Justement j'étais aussi sur Chrome ^^"
Quand tu édites le fichier html dans notepad il y a combien de lignes ? Au moment de télécharger le HTML, téléchargez la page complète, pas juste le code html ! » Téléchargez vite vos Vines !